James E. Thornton received a B.S.E.E. degree from the Univerty of Minnesota in 1950. He worked at Engineering Research Associates/Remington Rand Univac from 1950 to 1958. At Control Data Corporation from 1958 to 1973, he helped design the CDC 1604, 6600, 6400, 6500, and STAR-100. 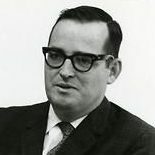 In 1974 he founded Network Systems Corporation, which manufactures shorthaul data communications units that interconnect large-scale computers and minicomputers. Read more about the CDC 6600 Project.